Founder of Hardeman Landscape, Jeff Hardeman, began his entrepreneurial adventure in 1983 when he was eighteen years old and purchased a lawn mowing company with a loan from his father. Since then, Jeff has established himself as an accomplished, and successful business man in Central Florida. Drew has 12 years of experience with the Hardeman companies designing, developing and managing premier residential and commercial projects in the Tampa Bay area. Drew studied at the University of Florida and Florida Gateway College. An eighth generation Floridian, he also enjoys getting into nature by kayaking, fishing, and hunting in different locations around the state. He and his family live in S. Tampa and are deeply involved in the community. John’s varied interests have fostered his reputation for out of the box thinking, weaving value into any scale project or budget beautifully. John grew up in the Delaware Valley, inspired by regular visits to the nearby Dupont Estate gardens of Longwood, Winterthur and Nemours. Always outdoors, an Eagle Scout, John was destined to study Landscape Architecture at Penn State and was licensed three years after graduation. Nearly forty years later, having logged over 50,000 miles traveling the South and reporting on garden design for Southern Living magazine, designing and building projects in eleven states and four countries, John is finally ready for your project. He holds a Certified General Contractor license in Florida. John lives with his “most challenging” customer, a college professor, working on their ever-evolving Odessa backyard. When he steps away from design, he enjoys tinkering with his ’89 Alfa Romeo, dabbling in fiction writing, or exploring the rain forests of central Costa Rica. Michelle graduated from Kansas State University in 2005. She has been working in the landscape industry in St. Louis and Tampa for 13 years. She acts as a lead designer for residential projects, and as a commercial estimator. She enjoys building a personal relationship with the customer through the design/build process. She looks forward to working with you and creating your own personal outdoor oasis. When not designing your new yard, she enjoys being with her family and friends outdoors at the beach, boating, cooking, playing with her dogs, and traveling to new destinations. Graduate of USF and Tampa Native, Chris is an avid outdoors man and brings many years of construction experience to his position. 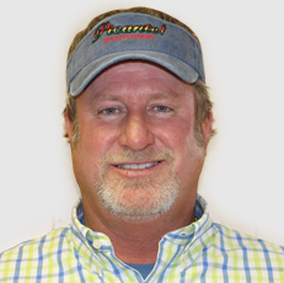 Andy has been a manager with Hardeman for over 20 years and specializes in running our field crews. Joey brings over 30 years of commercial construction experience to the company and specializes in our Concrete division and Commercial Landscape projects. Mike is the General Manager of the Maintenance and Horticultural Services division at Hardeman. He has devoted his entire career to working in the green industry. He brings a strong work ethic and experience to his position.